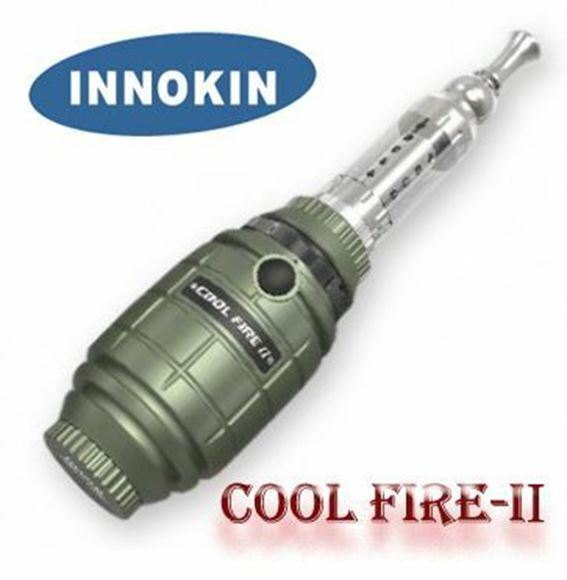 Introducing Innokin New Mod - Innokin Cool Fire 2 II Starter Kit. Designed in a form of a Grenade. This s a high-end eCigarette vapor device with many great features like , variable wattage up to 12.5W, scale display wattage, overtime vaping warning, reserve battery protection circuit, and brand new Innokin iClear 30B Dual Coil Clearomizer Tank. It is a perfect electronic cigarette MOD for all you military fans. - Scale display wattage improves intuitive control and provides more accurate performance. ** Batteries are NOT included. it takes 18350 battery. Innokin Cool Fire 2 Takes Flat Top 18350 Batteries as well as Button Tops, but button top might push the pin a bit, hence better to order flat top.